Show Your True Colors in Downtown Lansing! The Color run is a unique road race and a big, bright, messy festival of life. come play. Alright thrill-seekers, health-nuts, attention-lovers - this one is absolutely just for you. This event set for a big time event right here in the Greater Lansing area, July 13, 2013. What is it, you ask? A one-of-a-kind run like you&apos;ve never seen. THE COLOR RUN! The Color Run 5k is a unique experience focused less on speed and more on crazy color fun with friends and family. Color runners come from all different ages, shapes, sizes, and speeds; but everyone toeing the start line has a blast. Whether you are a casual morning mall walker or an Olympic athlete, the 3 miles of The Color Run course will be the most memorable and colorful run of your life! The Color Run event pretty much has TWO SIMPLE rules: 1) White shirts (any mostly white T will work great) mandatory at the start line. And 2) color plastered EVERYTHING at the finish! Runner/walkers begin the 5k at the start line like a brand new pristine coloring book. By the end, they look like they fell into a Willy Wonka tie dyed vat of colored goodness. We are the creators of an all new paint race phenomenon! What is the Color? Each kilometer of the event is associated with a designated color: yellow, orange, pink, or blue. As the runners/walkers reach the Kilometer COLOR Zones, they are blitzed by our volunteers, sponsors, and staff with COLOR. All products are 100% natural and safe. You can eat the stuff if youd like (we have tried it and dont suggest it, it is surprisingly high in calories and leaves a chalky aftertaste). See the diagram below for the COLOR ZONE specifics. Of course, we save the best for last, ending the race with a color extravaganza of epic proportions. Staying Up-to-Date For the latest in race updates and runner giveaways stay tuned to this web page, or follow The Color Run facebook or twitter pages. What about the finish line? I think we can safely say our finish line is the best post-5k party on the PLANET. 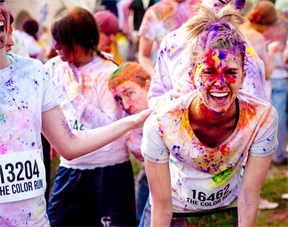 After the finish, participants are encouraged to stick around, celebrate, and see exactly how much COLOR one person can handle. We will have food, color, and festivities that will make your color-powdered head spin.